Anytime Golf Tour is a golf league designed to give affordability and flexibility to individuals who couldn't normally commit to play (or pay) every week on the same day, same time, and same golf course – as in traditional golf leagues. It allows players to golf their round on their own time, enter their scores online, and still maintain an acceptable level of honesty. The Tour regular season will involve eight 9-hole rounds of golf at eight different courses in Omaha. Each registered player will have approx. 2 weeks to play the specified 9-holes/course scheduled for that time period (opening and closing dates will be specified on the schedule). The round is played on the player's own time, anytime within the specified 2-week period, but must be played with at least one other member of the Tour - in order to verify scores and keep each other honest! After the round has been played, each player will sign on to the league web site with a username and password that will be provided after registration & payment. Once signed on, the player will enter their score for the current round, and the name of the person they played with. That information will be sent to the stat keeper/webmaster to compile scores, rankings and stats. Once the 2-week period is over, that course is closed out and the next round/2-week period starts, with the new course on the schedule. Every round is an all vs all scenario. Meaning, the person with the best score for the round, out of all the golfers will rank highest, similar to PGA. After each round is closed, handicaps will be figured and adjusted for each golfer. Scores and rankings will then be posted on the website and a winner will be crowned for that particular round. At the beginning of the season, handicaps will be immediately figured after the second round of play and adjusted each round following (at least two scores are required to figure handicaps). For returning golfers, handicaps will be carried over from last year. The AGT standard handicap formula takes the average of your two best scores from your most current 4 rounds played (X). The average par for ALL courses scheduled on the tour (Y) is then subtracted from your score average. 80% of the difference is your handicap. Points will be awarded according to your finishing place for each round. First place receiving the most points, last place receiving the least. Accumulated points throughout the tour regular season will determine the final pre-tournament rankings. If you do not enter a score by the closing of the allotted time for each round (11:59 PM on closing date), you will receive a no-score (0 points!) for that round. The final top 24 golfers will enter the tournament rounds for a chance at the title! Each of the top 24 golfers will be seeded into a single-elimination bracket. Rounds one and two of the tournament will be played much like the regular season with two exceptions: 1.) You will only have ONE week to play the specified course, and 2.) Your score will only be compared to the score of the one(s) you've been matched with in the tournament (you don't have to play on the same day as your opponent(s), but you'll still need to have another member of the tour present). 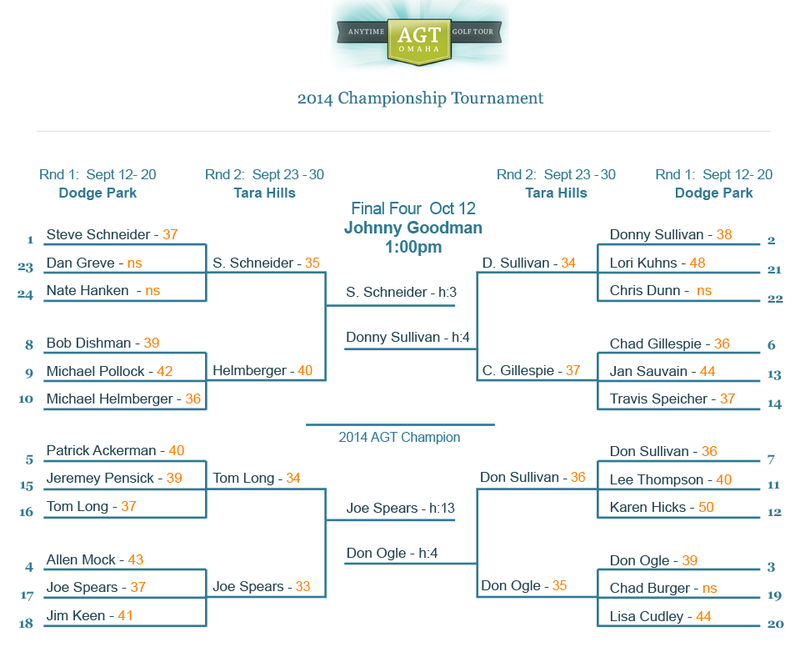 For the semi-final round, the final four golfers will face-off at the Best-Ball outing. While all other (previously eliminated) golfers play in the Best-Ball, the final four will be grouped together in an 18-hole match to decide fourth, third, second and Champion! They will play at the tail-end of the Best-Ball four-somes so everyone else will be able to watch the action as the final four approaches the 18th. Each course will have a tie-breaker hole. When entering your score for that round, you will also be asked to enter your score on the tie-breaker hole. This will help break ties between players with the same overall score for that round. Two or more players with the same score within a round, even with the tie-breaker hole, will both/all receive the points given for that particular ranking. Example: If Bob and Joe end the round tied for 1st, they are each awarded the full first place points. In the event of a tie in total accumulated points at the end of the tour regular season, the tie-breaker will first be the highest average place-finish of all rounds, then the lowest total golf score (handicap adjusted) of all rounds, then the lowest total scratch score of all rounds.